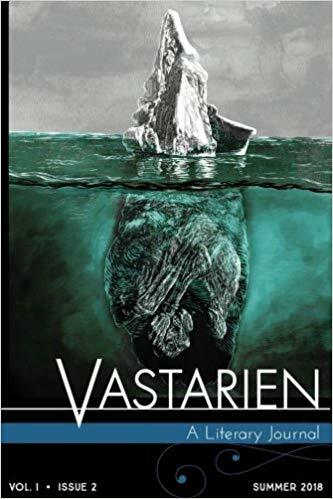 I am happy to announce that Vastarien, Vol. 1, Issue 2 by Grimscribe Press is out and it features my poem, The Crafter of the World! Cover Art by Yves Tourigny. Book design by Anna Trueman. Internal art by Giuseppe Balestra, Ksenia Korniewska, Serhiy Krykun, Carl Lavoie, and Art of Øyvind Lauvdahl. Co-Editors-In-Chief, Matt Cardin and Jon Padgett. Senior Editor, Dagny Keith Paul. I love horror and then fantasy only slightly less and then science fiction. I write pretty evenly between horror and fantasy with dark fantasy being a good middle ground. Rarely do I write science fiction. And rarely do I write fiction at that. But I've written two science fiction short stories out of the 8 fiction stories I've written since taking my writing seriously in roughly 2011. The first of these two stories is called Infused Realities which can be read for free here. Unfortunately, what I originally wrote and what was published ended up being two completely different stories. The editor and I didn't quite see eye to eye but at that time I was naive and thought that whatever the editor said was for the best. But that's beside the point. The point actually being, that the second science fiction story I wrote is based in the same world with a reoccurring character and that story, Amadis the Enchantress, has just been accepted for Test Patterns: Creature Features by Planet X Publications!! Amadis the Enchantress marks my third short story sale ever and as primarily a poet, I couldn't be more shocked and amazed that this happened. The tentative release date is October. If you can't finish reading Infused Realities (I understand), my poem Vexteria is about the planet that Infused Realities and Amadis the Enchantress takes place on. Vexteria can be found in Spectral Realms No. 2 by Hippocampus Press, Within Stranger Aeons by J. Ellington Ashton Press, and Diary of a Sorceress. On another awesome note, my poetry reprint, II. Bat in the Boiler Room, has been accepted for Haunted are these Houses by Unnerving Magazine! That is scheduled to come out in September. Horror and weird-fiction aficionados will love this print magazine. What is an "Audient Void"? 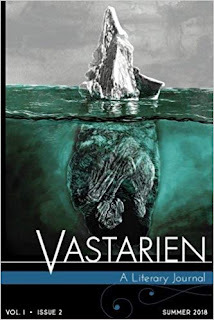 Well the official byline is: "The Audient Void is a periodical devoted to publishing Weird Fiction and Dark Fantasy as well as poetry and select works of non-fiction." Audient is akin to audience and infers that there is a sentient void (nondescript shadow entity) that listens from beyond our normal senses. As readers consuming this horror anthology, are we in the Void listening? Or watching from outside? I'm a big fan of John R. Fultz, his name and Darrell Schweitzer brought me to this magazine and I was not disappointed. I also frequent the Grim Tidings podcast and recommend that as well. "Old Lovecraftians In The Park" by David Barker ; Creepy old man ogling girls in the park is the focus, he gets inspired by nostalgia and an old friend’s writings of the genius-loci of the park… he matures in a weird way. "Why Should We Worship Dagon" by Darrell Schweitzer; Funny call to join the ranks of Dagon worshipers. This reminds me of his actual words when I talked to Darrell at the WFC 2016. I am happy to announce that my two sonnets, Conquest and War, have been accepted for issue six of The Audient Void: A Journal of Weird Fiction and Dark Fantasy! Conquest and War are the first two poems of a mini sonnet cycle entitled the Seven Seals. The cycle contains a sonnet featuring each of the seven seals from Revelations. I was originally only going to write about the Four Horsemen and have that be a mini sonnet cycle by itself but I'm a completionist and decided what's three more sonnets? I also have never read the Bible in its entirety because it's just not my thing. I just skipped to the end to get to the good parts.